Thanks to advances in modern dentistry, innovative technologies have now become an integrated part of comprehensive routine and complex procedures. In particular, laser dentistry has transformed conventional treatments for certain dental issues, such as periodontal disease and other gingival conditions. At our state-of-the-art Alexandria dental office, Dr. Leo Rosenthal utilizes this advanced technology to provide minimally invasive care that effectively addresses their unique conditions. There are a number of immediate and long-term benefits associated with the incorporation of laser dentistry into routine and complex procedures, many of which are based on how soft tissue lasers function. Dental lasers utilize a small beam of light energy to precisely target the affected area, ensuring accurate treatment every time without the need for scalpels or other conventionally invasive tools. The elimination of traditional surgical instruments leads to a number of treatment advantages. As treatment with soft tissue lasers is precise and minimally invasive, patients often acclimate quickly to it during their procedure. The laser also makes no noise and creates no vibrations while being using, eliminating the unpleasant sounds and sensations associated with dental drills that may be required in traditional treatments. As a result, many patients find themselves able to undergo dental laser care without the need for sedation. Dental lasers also yield a number of post—operative benefits. As the laser cauterizes soft tissue during treatment, the expected healing time following dental laser care is much shorter than that of procedures that rely on scalpels and other traditional tools. 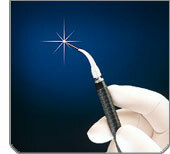 Given the precision of soft tissue dental lasers, patients often experience minimal to no discomfort post-treatment and are often able alleviate any discomfort with basic over-the-counter pain relievers The cauterization of the tissue also helps to ensure successful healing by lowing the risk of post-treatment infection. With soft tissue dental lasers, patients are able to enjoy comfortable recovery that encourages lasting oral health. By utilizing this advanced technology, our Alexandria patients are able to enjoy comfortable care and lasting benefits. For more information about integrating dental lasers into your next treatment plan, contact our dental office to schedule your consultation.